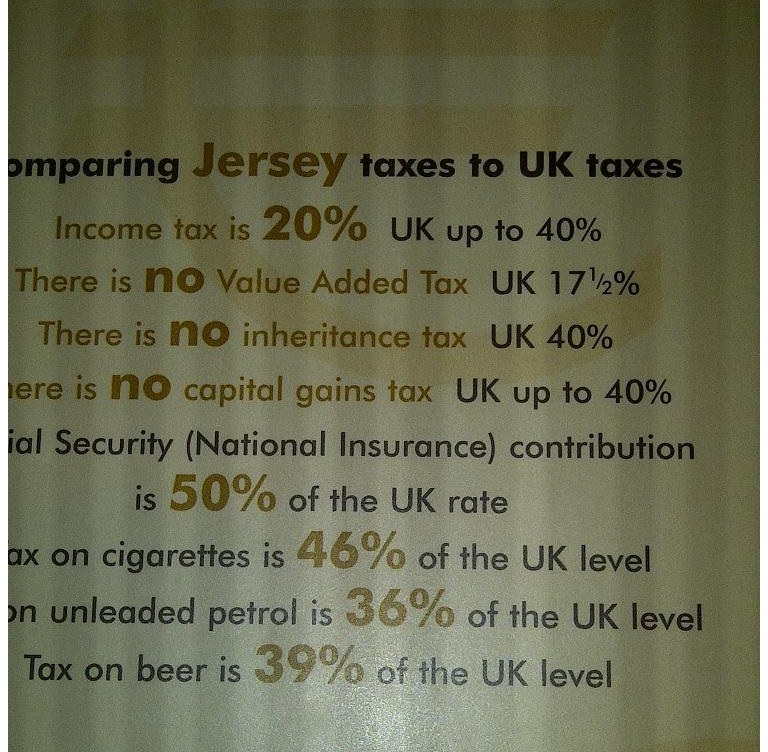 The British territory of Jersey, for in stance, has a very good tax system. It has a low-rate flat tax and it overtly brags about how its system is much better than the one imposed by London. In the United States, by contrast, the state of New Jersey has a well-deserved reputation for bad fiscal policy. To be blunt, it’s not a good place to live and it’s even a bad place to die. And it’s about to get worse. A column in the Wall Street Journal warns that New Jersey is poised to take a big step in the wrong direction. The authors start by observing that the state is already in bad shape. …painless solutions to New Jersey’s fiscal challenges don’t exist. …a massive structural deficit lurks… New Jersey’s property taxes, already the highest in the nation, are being driven up further by the state’s pension burden and escalating health-care costs for government workers. In other words, interest groups (especially overpaid bureaucrats) control the political process and they are pressuring politicians to divert even more money from the state’s beleaguered private sector. …politicians seem to think New Jersey can tax its way to budgetary stability. At a debate this week in Newark, the Democratic gubernatorial nominee, Phil Murphy, pledged to spend more on education and to “fully fund our pension obligations.” …But just taxing more would risk making New Jersey’s fiscal woes even worse. …New Jersey is grasping at the same straws. During the current fiscal year, the state’s pension contribution is $2.5 billion, only about half the amount actuarially recommended. The so-called millionaire’s tax, a proposal Gov. Chris Christie has vetoed several times since taking office in 2010, will no doubt make a comeback if Mr. Murphy is elected. Yet it would bring in only an estimated $600 million a year. The column warns that New Jersey may wind up repeating Connecticut’s mistakes. Going down that path, however, is a recipe for a loss of high-value taxpayers and businesses. Let’s look at a remarkable story from the New York Times. Published last year, it offers a very tangible example of how the state’s budgetary status will further deteriorate if big tax hikes drive away more successful taxpayers. One man can move out of New Jersey and put the entire state budget at risk. Other states are facing similar situations…during a routine review of New Jersey’s finances, one could sense the alarm. The state’s wealthiest resident had reportedly “shifted his personal and business domicile to another state,” Frank W. Haines III, New Jersey’s legislative budget and finance officer, told a State Senate committee. If the news were true, New Jersey would lose so much in tax revenue that “we may be facing an unusual degree of income tax forecast risk,” Mr. Haines said. Here are some of the details. …hedge-fund billionaire David Tepper…declared himself a resident of Florida after living for over 20 years in New Jersey. He later moved the official headquarters of his hedge fund, Appaloosa Management, to Miami. New Jersey won’t say exactly how much Mr. Tepper paid in taxes. …Tax experts say his move to Florida could cost New Jersey — which has a top tax rate of 8.97 percent — hundreds of millions of dollars in lost payments. …several New Jersey lawmakers cited his relocation as proof that the state’s tax rates, up from 6.37 percent in 1996, are chasing away the rich. Florida has no personal income tax. By the way, Tepper isn’t alone. Billions of dollars of wealth have already left New Jersey because of bad tax policy. Yet politicians in Trenton blindly want to make the state even less attractive. At the risk of asking an obvious question, how can they not realize that this will accelerate the migration of high-value taxpayers to states with better policy? New Jersey isn’t alone in committing slow-motion suicide. I already mentioned Connecticut and you can add states such as California and Illinois to the list. What’s remarkable is that these states are punishing the very taxpayers that are critical to state finances. …states with the highest tax rates on the rich are growing increasingly dependent on a smaller group of superearners for tax revenue. In New York, California, Connecticut, Maryland and New Jersey, the top 1 percent pay a third or more of total income taxes. Now a handful of billionaires or even a single individual like Mr. Tepper can have a noticeable impact on state revenues and budgets. …Some academic research shows that high taxes are chasing the rich to lower-tax states, and anecdotes of tax-fleeing billionaires abound. …In California, 5,745 taxpayers earning $5 million or more generated more than $10 billion of income taxes in 2013, or about 19 percent of the state’s total, according to state officials. “Any state that depends on income taxes is going to get sick whenever one of these guys gets a cold,” Mr. Sullivan said. The federal government does the same thing, of course, but it has more leeway to impose bad policy because it’s more challenging to move out of the country than to move across state borders. New Jersey, however, can’t set up guard towers and barbed wire fences at the border, so it will feel the effect of bad policy at a faster rate. P.S. I used to think that Governor Christie might be the Ronald Reagan of New Jersey. I was naive. Yes, he did have some success in vetoing legislation that would have exacerbated fiscal problems in the Garden State, but he was unable to change the state’s bad fiscal trajectory. P.P.S. Remarkably, New Jersey was like New Hampshire back in the 1960s, with no income tax and no sales tax. What a tragic story of fiscal decline!